England, 1959. Free-spirited widow Florence Green risks everything to open a bookshop in a conservative East Anglian coastal town. While bringing about a surprising cultural awakening through works by Ray Bradbury and Nabokov, she earns the polite but ruthless opposition of a local grand dame and the support and affection of a reclusive book loving widower. As Florence's obstacles amass and bear suspicious signs of a local power struggle, she is forced to ask: is there a place for a bookshop in a town that may not want one? 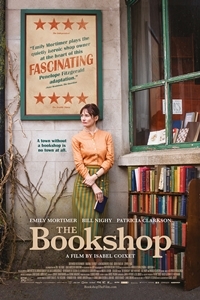 Based on Penelope Fitzgerald's acclaimed novel and directed by Isabel Coixet, The Bookshop is an elegant yet incisive rendering of personal resolve, tested in the battle for the soul of a community.